I've seen these in catalogs for years and always wanted to receive one. I know. The crazy things we wish for, right? 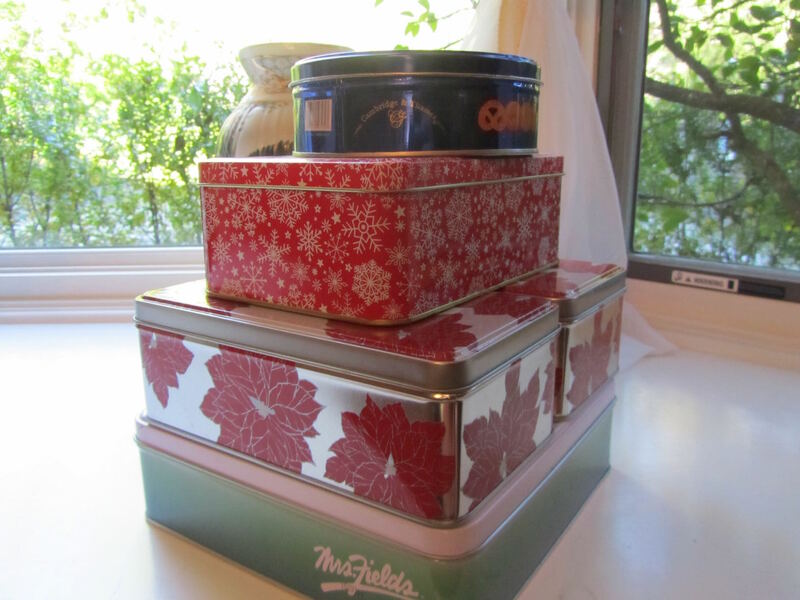 Anyway, as mentioned yesterday, I am putting together a tower for a gift, using some of my stash of tins. Here's a photo of the tins that I think will work. There are 5 tins altogether. The top one and bottom 3 (the poinsettia 2 are side by side) are vendor tins. The bottom and top one have labels on them, while the 2 poinsettia tins just say "Happy Holidays." My thought is I only need to paint the bottom and top tins in the photo, as the other 3 will look fine, as is. I'm using some gold spray paint on those two. I've just sprayed the first coat and will do a second coat in a bit. If any of the design shows through, I'll add some extra trim, like ribbon or spray "snow." The top tin has a raised design on the lid. I plan on covering that with a silk blossom, wreath of silk leaves, or large bow, hot-glued onto the top. I just checked the tins, and the paint is looking good. Here are the bottoms to the tins. The color is kind of off in the photo. They are definitely gold, and not coppery. No printing shows through, but I think I will wrap a band of red ribbon around the bottom tin to thematically tie it into the rest of the tins. On spray painting tins -- I cleaned the interiors with soapy water and dried well, using a toothpick to clean out the crack where the base meets the side. I also used rubbing alcohol to thoroughly clean the exterior, so the paint would adhere evenly. I did not do anything else to prepare the tins. I place the tins, upside down, on boxes, in order to spray the sides evenly, without getting paint inside. I plan on leaving the tins open for a week or so, before putting lids back on, to let the paint thoroughly harden. I am very pleased with how the tins painted. As far as I can tell for now, this is a great solution for sprucing up tins. I have not received a tower before, but my sister has received a couple of them. What I have observed is that they are always pretty but don't have much in them for the size they are. I have a feeling that yours will be filled better than the commercial ones. Looking forward to seeing your progress. well that makes me feel better about never having received one. They must be like those pre-filled gourmet gift baskets; the baskets look so full of goodies, but there is a lot of filler holding everything up. I have never seen a tower before! How does it get held together? What is in the tins? The towers that I've seen have a ribbon going up all four sides and tied at the top to hold the stack together. Inside are a variety of snacks and treats, each tin containing a different kind of treat. So far, I've decided to fill the top, round tin with spiced nuts. As I decide what goes in each I'll share more details. 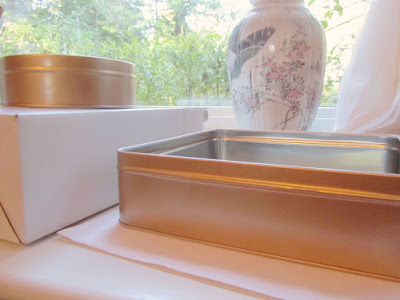 Today, I'm working on the 2 tins that I spray painted, adding some trim. I'll share a photo later this afternoon. Have a great afternoon and evening.